Salesperson candidates can be some of the hardest to evaluate. Most of the traits that make them successful are soft skills, that are difficult to quantify. Track record and education are important, but do not give the whole picture. The two greatest qualities a salesperson can have is being quick thinking, and relatable. Conversations with potential clients are unpredictable, and can shift in an instant. Canned scripts and wooden presentations, no matter how good the content, come across as disingenuous and alienate customers. The best sales reps react quickly to changes in tone and topic naturally. To hire the right people we need to ask questions that identify these quick thinkers. 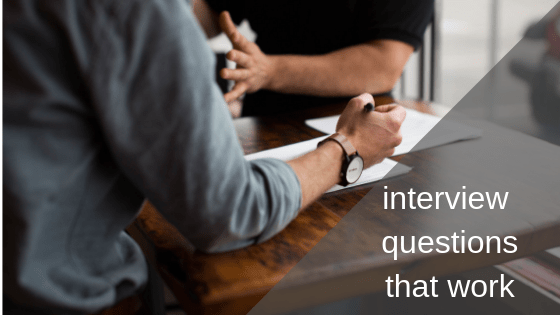 Here are 3 interview questions that get the responses you need to make an educated decision. 1) Give us 3 words to describe why a person should buy our product. You have every right to expect that a person seeking a position with your company understands what you sell. Rather than asking the candidate to sell you pen, see if they did any homework. Is this candidate coming to your company because they are excited about your product, or are you just an opportunity for a paycheck? Limiting the answer, initially, to 3 words forces the candidate to think quickly and removes the use of any canned language. Once they give you the 3 words ask the applicant to describe how they would present these traits of your product to a customer. Look for detail and passion in how they describe selling your product. 2) Describe the worst purchase experience you have ever had. Does the candidate have the ability to empathize with customers? Can they relate to the things that frustrate buyers? Get a detailed description of a purchase experience that the applicant didn't like. Listen for the root problem, and how the applicant went about handling the issue. Did they confront someone, or just simply accept the bad service and vow to never go back? This will tell you a little about whether they are fight or flight people when confronted with a difficult customer. Next have them explain how things could have been improved and if they used this experience to better their own sales process. A top notch candidate will show that they are insightful enough to learn from every experience, and will use story telling and detail. 3) What advice would you give our sales team to be more successful? This is a variant of, "what is your best skill?". Tell the candidate that you like new employees that come from other companies to share things that work. That it helps make sure the company is up to date on the latest trends, and is using every tool possible to improve the sales team. Ask the applicant to pretend they are being called upon during their first sales meeting, and need to share something from a previous job that worked well. This gets much more information than the best skill question that many times gets one word answers. Dig to have them explain how this worked in practice. You might even find some new ideas to help your company in all your interviews. Take good notes during your interview, or even better record the session. Dissect the candidate answers for ability to story tell their answers, quickness on their feet, and passion. Best of luck finding your perfect employee, and if you need some help or have more questions just ask. We love to help.